The legal cannabis industry is receiving more attention than perhaps any other industry in the United States today. With each passing year, more states are putting legislature up to vote, passing recreational and medical cannabis laws in different pockets around the country. In fact, the cannabusiness is developing at an impressive rate and some sectors of the legal industry can hardly keep up with demand. Legal marijuana jobs build on the same positions that bolster the black market, in addition to jobs that focus on the regulatory back end. By assigning a negative connotation to cannabis, Americans would unknowingly create a hostile environment for marijuana advocacy over the next one hundred years. As history unfolded and major events like the Harlem Renaissance and prohibition occurred, powerful businesspeople and legislators would use the demonized connotation of cannabis to subjugate minorities, especially Mexican-Americans and black Americans. All the while that cannabis was outlawed on a federal level, cultivators and distributors were running simultaneously successful, illicit grow operations in areas like Humboldt County, California, Southern Oregon and surrounding regions that provided the necessary sun and heat for cannabis to grow vigorously. This underground operation became so ingrained into interstate distribution and American culture that many cannabis advocacy groups would form once that caught wind of the medical potential that scientists had been studying with little funding throughout the years. In schools, cannabis would be referred to as the Gateway Drug, when, in reality, finding of this of largely inconsequential. In 1970, Nixon signed the Comprehensive Drug Abuse Prevention and Control Act of 1970, which created a precedent for the still in effect scheduling of Cannabis as a Schedule 1 substance. This categorization places cannabis above drugs like cocaine and Vicodin and a more “potentially dangerous” and less medically beneficial drug. While this law became a major step forward in allowing medical marijuana patients to access cannabis through their own home grow-ops or caregivers, it is explicit in forbidding commercial grow operations or interstate trade. The next twenty years would show the emergence of more marijuana supporters of all backgrounds. Doctors, researchers, parents and others called for stripping away the stigma from cannabis in replacement with comprehensive legal measures. At present, around half the country allows for some sort of medical and/or recreational cannabis cultivation or use, bolstering a legal economy that would facilitate marijuana tourism jobs, among others and provide medical benefits that no other drug could offer. Now that comprehensive American cannabis legalization is on the brink, job seekers are looking to this green rush to find fulfilling legal marijuana jobs. Cultivating cannabis under black market operations was an eat or be eaten environment. Especially in the highly concentrated regions of Humboldt County, California and Southern Oregon, competition to produce the best crop was high. The beauty of the illicit industry is the opportunity for a big personal payout. Underground cultivators aren’t exactly known for paying taxes and due to non-existent regulatory oversight, growers had the potential to strike it rich, then going to hiding until next season. While this setup might sound like a fantasy to some, it came with inconsistent payouts and the threat of legal fines and arrest. Now, as legal marijuana jobs in growing are available on a larger scale, the setup promises more transparent business practices, admittedly with the possibility of earning less revenue now that income taxes apply to legal operations. You might have heard of the famed “master grower” of a cannabis cultivation operation. These leaders are experienced, educated cannabis lovers and horticulturalists who plan and execute a successful crop from seed to harvest. Master growers are often equipped with a team of grow assistants who help with maintaining the plants, especially as they reach maturity and require more individual attention. One of the sectors creating the most legal marijuana jobs are cannabis dispensaries. Dispensaries acquire products wholesale from legal cultivation operations and processing centers and sell the products to medical and recreational customers. Dispensaries act as a great foot in the cannabis industry door and can be a great springboard for advancing to future legal marijuana jobs. Dispensaries maintain similarities and differences to other retail and consumer-driven establishments like coffee shops and bars, with a noticeable difference being the extreme compliance measures cannabis dispensary workers must take to keep their store open. Comprising the largest sector of dispensary staff are budtenders and receptionists. As far as legal marijuana jobs go, these two positions are frequently deemed as entry level marijuana jobs. Despite this status, budtenders and receptionists are responsible for being kings of compliance and obtaining an in-depth knowledge of cannabusiness laws, terminology and product awareness. Legal cannabis dispensaries look to employ budtenders who are simultaneously responsible and empathetic with cannabis customers new and old. As the recreational marijuana market breaks in more states across the U.S., the demographic of cannabis connoisseurs is expanding far beyond the stereotypical stoner aesthetic. As more licenses are awarded to processing facilities, a wider variety of cannabis flower strains, concentrates, tinctures, edibles, topicals, paraphernalia, apparel are able to be purchase by customers. Therefore, budtenders need to be well-versed on all the products they offer, giving helpful suggestions for the best product to suit the needs and desire of customers. Budtenders are expected to experiment with different strains and products on their off time so they can be legitimately experienced with the products they offer in stores. Luckily for budtenders, they are able to purchase weed at discounted prices, saving the steady stoner a pretty penny in weekly weed costs. Aside from direct service responsibilities, budtenders perform upkeep-related tasks in the dispensary storeroom and other areas that require their attention. This often entails basic cleaning responsibilities, inventory, grinding cannabis and rolling/filling joints. Dispensary receptionists take on the responsibility of checking in customers and processing their identification. Much of a receptionists day involves data entry and other administrative tasks. The best receptionists are organized and are good communicators. On any given day, receptionists will communicate with customers, superiors and business partners via phone and email. While this job doesn’t involve the same hands-on tasks appropriated to budtenders, receptionists must still be well-informed on cannabis law and compliance, in order to keep a business running smoothly. Both budtenders and receptionists are compensated in keeping with the average wages of other service industry workers. Hourly compensation begins at minimum and averages around $11-12. Some dispensaries allow for customers to tip budtenders and receptionists, increasing the hourly wage of these workers by a dollar or two. Dispensary managers are the main staff responsible for overseeing the daily operations of dispensary sales. These individuals wear many hats as supervisors, budtenders and every job in between. Managers maintain direct business relationships between farms, processing facilities and marijuana sales reps. This means taking inventory and ordering products, hiring and training new staff and carrying out everything the owner wants during the day. Unlike the previous two positions, dispensary managers receive competitive compensation, as they are expected to be qualified, with previous experience in both management and cannabis. As far as legal marijuana jobs go, this position has some of the most responsibility assigned to it. This is because managers are usually the ones to take the brunt of government crackdowns and any other compliance-related issues. Dispensary security guards are not always employed in dispensaries, though they are key members in preventing external and internal theft. Every dispensary has some sort of security protocol since the cannabis industry is especially at risk for experiencing crime. Security guards at pot shops are very similar to guards and bouncers at bars and clubs. These individuals check I.D.s, oversee the lobby and deescalate any issues that may arise and need their interference. Many dispensaries that employ security guards will not allow the guard ti be armed, in order to maintain a peaceful store atmosphere. Dispensary owners are the courageous cannabis lovers who agree to take on the confusing experience of opening up a legal pot shop. Owners invest their time and money into establishing a compliant, competitive business that will stand above the rest. Pinpointing the exact responsibilities of a dispensary owner can be hard, since they are ultimately the one in charge of the business as a whole. Some owners choose to be more hands off with daily operations, focusing primarily on financial and administrative tasks; others prefer to keep their business closer at hand for the day to day. The potential payout for dispensary owners, runs the gamut. Tis can be one of the most lucrative legal marijuana jobs, or it can drain the owner’s personal bank account. As the industry continues to develop and more entrepreneurs are awarded business licenses, it will be interesting to see how the process of opening a pot shop changes. Many people know how cannabis is grown and where it is sold, but not how it is processed! Once mature cannabis flowers and trim are harvested, a number of different formulas can be taken to manicure the results into purchase-ready buds, or to turn into a number of different substances. Aside from dispensary reception and budtending, trimming is one of the few entry level marijuana jobs still in the legal market. Trimming is a necessary part of cannabis processing that distributors and customers alike have come to expect when selecting a strain to sell or purchase. Trimming is simply the process of removing excess plant matter from cannabis flowers. While there are machines that can carry out the process without humans, many grow operations still like to employ real trimmers to make sure the finished product is as perfect as it can be. Experienced bud trimmers are able to whip through an amazing amount of untrimmed flower and produce a consistently trimmed product that weighs in and cashes trimmers out. Under the illegal market, some trimmers were able to use their speedy skills to make $20 or more based on weight. Even with income taxes, trimmers in the legal market can still make decent entry level wages from $12-15 and beyond. The trimming process has several reasons for being omnipresent in American cannabis sale. Firstly, the highest concentration of compounds like THC, CBD and terpenes are found in marijuana flowers. Because of this, trimmers keep those trichome rich parts and dispose or set aside plant matter like fan and sugar leaves that contain drastically lower concentration levels. A recognizable result of legal marijuana jobs is the influx in demand for cannabis concentrates. Concentrates are created by extracting essential cannabis compounds (like the ones listed in the above trimming section) and separating it from the unnecessary plant matter. By doing this, cannabis extraction technicians are able to create highly potent, pure substances that are ideal for medical patients and recreational customers interested in dabbing. Concentrates take on a number of different forms including, but not limited to waxes, shatters, oils, crumbles. The substances can then be infused into other products or smoked directly primarily using vaporizers or dab rigs. The legal marijuana jobs in charge of performing the extraction are technicians who work in labs and use industrial solvents, heat and pressure to chemically separate the substances. As you may have guessed, this is not an entry level position. In fact, extraction technicians are assumed to have at least an undergraduate or higher in chemistry or an associated science. The act of extracting itself can be very dangerous as it involves extremely high heat and the potential of fire and explosion. Additionally, extraction techs have to be organized, clean and record data accurately. A result of the influx in concentrates are the continued and advanced production of marijuana edibles. Edibles have historically infused cannabutter into food product, whereas current edibles chefs frequently use CO2 concentrates instead. Cannabutter is the resultant of decarboxylating cannabis plant matter in butter or oil over medium low heat for a number of hours. The end result is a potent, earthy tasting cannabis product. Conversely, concentrates are easier to infuse discreetly into consumables as they do not have as prominent a taste since the plant matter is absent. While many job seekers would love the opportunity to lead or assist in a commercial edibles kitchen, the reality of the matter is that this job is suited to seasoned professionals. Like the former legal marijuana jobs, working in a commercial edibles kitchen involves keeping perfect compliance. In some cases, this means not even being able to try your infused cannabis edibles, since on-site consumption is strictly prohibited. 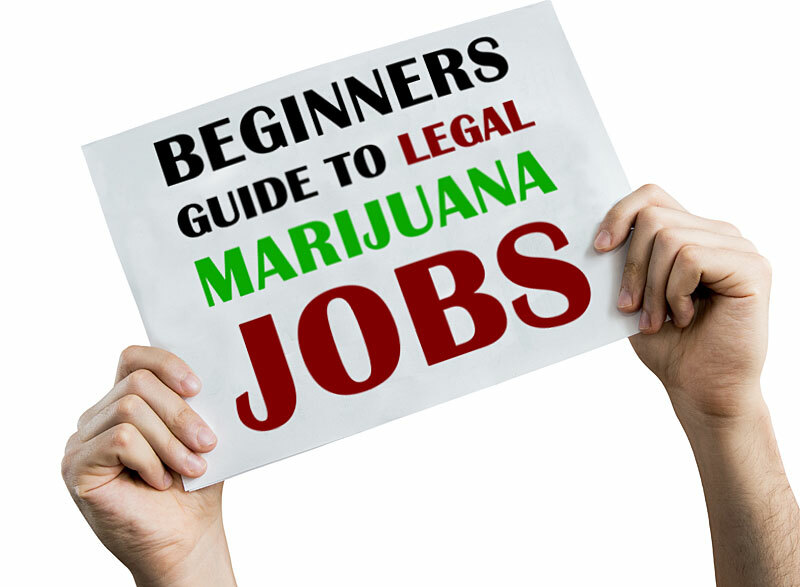 While the positions listed above represent some of the most hands-on legal marijuana jobs, there are plenty more where that came from. In fact, nearly every industry embracing cannabis has a place for it in its yearly operations. Especially when it comes to the tourism industry, as well as marketing, design, consulting and regulation, the cannabusiness is opening doors for legal marijuana jobs seekers across the country.